Home > Posts > Types of Warts > Senile wart > Senile Warts: What Is It and How to Get Rid of It Effectively? Horny formations in the form of warts, which are formed on the skin of the elderly, are called senile warts or keratomas. Keratosis occurs most often after 50-60, although there are cases when senile warts appeared at an earlier age – about 40 and even 30. Being now dangerous for the health, they may become a great problem for a person, which is why specialists are developing more and more new methods on how to remove warts effectively and safely. If you have faced the same problem, you are welcome to learn more about this kind of wart and discover what you personally can do to prevent their appearance. Causes of Senile Warts: Why Do They Appear? All other types of warts grow in humans because of the activity of the papilloma virus. But the case under consideration has no viral nature, that is, keratosis is not contagious. Unfortunately, doctors do not call the exact reason for its occurrence. Therefore, there is no 100% way to prevent disease. To reduce the number of new formations is helped by complex therapy and treatment with natural remedies. The only way to get rid of old ones is just remove them. The person consumes an excessive amount of animal fats with a lack of vegetable oils. But none of these assumptions has found sufficient evidence. The results of the observations showed that the patients have only two common features: age over 40 and the presence of a predisposition that is transmitted genetically. Many people of adulthood have spots of brown, pink, corporal and even black in their skin – age-related keratomas. They are flat and convex, sometimes they are papilliform. Over time, the formation is covered with horny scales. Formations appear on any parts of the body, except for the lower part of the foot and palms. Number – from single to multiple, location – individually or in groups. As a rule, keratomas do not cause pain and any other sensations. Sometimes, there is itching. Individual cases are characterized by the presence of an inflammatory process. The process of developing the disease is long, it can take more than 10 years. But this tumor is benign and never goes into oncology. On the other hand, sometimes the appearance of keratomas is very much like a precancerous condition. Such cases require professional diagnosis. Sometimes, senile warts begin to grow actively. The disease goes to the stage of the cutaneous horn, when the growths really look like horns. Stage 1. Spotted form: The development begins with the appearance of small spots that have a brownish-brown color, and in the case of an elderly person appearing on the face, they have a pinkish-yellow or light brown tinge. The surface of the skin on these sites remains smooth, but very small roughness can be noted. At the present stage, there are no keratas yet. Stage 2. Papular (knot) form: At this stage, the formation of small nodules begins. These formations are irregular in shape, dirty yellow or dark gray. The appearance of horny scales at this stage is not yet observed. Stage 3. 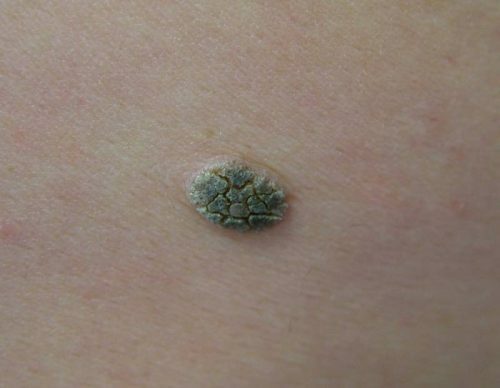 Keratonic: Nodules develop in the keratoma – a brown or gray-brown outgrowth covered with a crust. Rises above the skin a few millimeters. If the build-up is scraped, then a bleeding surface is observed. Stage 4. Cutaneous horn: After a while, the dermal horn begins to form from the wart. The affected area of the skin is covered with hard horny clusters, which gradually rise above the skin. After some time, the appearance of the wart changes and becomes darker in color. How to Treat Senile Warts Effectively: Which Ways Exist? Keratomas or senile warts rarely cause severe discomfort to a sick person. But the desire to get rid of them can arise from aesthetic considerations, for example, when the wart is located on the face. Treatment of senile warts can be difficult because standard methods of getting rid of such formations can have different contraindications. It consists in taking large doses of ascorbic acid. This variant of therapy is combined with the use of hormonal ointments, such as Advantan, Acriderm and Flucinar. 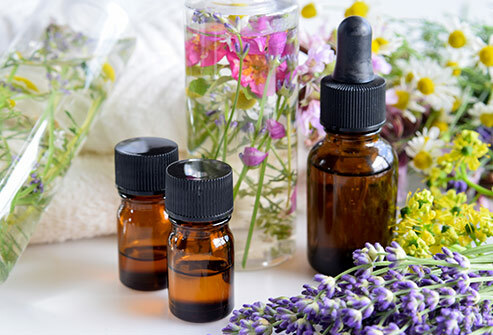 Natural homemade remedies have always been popular, especially among the elderly, besides it is always not expensive. Use of medicinal plant juices is quite effective. Juices of herbs celandine, aloe, dandelion of red currant and viburnum can help get rid of keratas that have appeared. Apply the remedy to the skin, covered with excrescences several times a day. It is better to use juice, rather than pharmaceutical means, because in that case there is a possibility of a scar. Vegetable oil helps to smooth the rough area. Used vegetable, fir, sea-buckthorn, which was previously calcined. But in the case of damaged keratoma, this method can not be used. Lemon, honey and garlic. Rubbed garlic, which is poured with boiling water, is applied to warts. Also, apply a mixture of the same proportion of garlic and lemon or garlic and honey, but in a proportion of three to one. It should be taken inside. Laurel Ointment. The ground laurel leaves are mixed with butter and lavender or fir oil. It is used for soreness and growth of formations. Compress from potatoes. Grated potatoes on a small grater spread on warts and fix with a bandage. The bandage is changed every hour for 3 to 4 hours. A pinch of flour is mixed with sal ammoniac and applied to the keratomas on the hands. It is applied once a day. 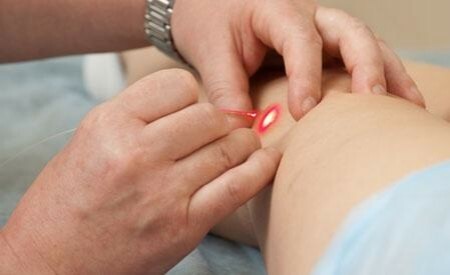 Removal of warts with a laser – exposure to affected areas by thermal radiation. The most popular and effective method. Cryotherapy – the skin is exposed to liquid nitrogen, the cells of formation die, and in its place appears a blister. After it is opened, the surface is covered with healthy skin. Radio wave method – removal occurs with the help of radio waves of high frequency. No need for anesthesia. Also, it does not leave scars. Surgical excision – warts are removed with a scalpel using anesthesia. Scars may remain, so it is not often used. The treatment of age-related keratomas at home should be complex. Therefore, in addition to the removal of warts, it is necessary to carry out general strengthening measures. Hardening, therapeutic diet and gymnastics are used. A strong immune system is able to fight the virus and prevent the recurrence of senile warts. When having senile warts, you should eat foods containing vitamins of group C, because they prevent the growth of radionuclides. If the body had seborrheic warts, then the diet should include fresh vegetables, for example, potatoes, radish, cabbage, tomatoes. Useful greenery is considered: dill, spinach and parsley. Don’t forget to strengthen the immune system with the help of medicinal decoctions and infusions. They not only strengthen the defenses of the body, but also increase the effectiveness of treatment. For this purpose, you can prepare a decoction at home. Note: Some products with keratosis are considered harmful. They provoke the growth and multiplication of cells, which as a result leads to an increase in the number of free radicals. Such products include semi-finished products, canned food, marinades, smoked products, flavoring and coloring agents, as well as sweet carbonated drinks. Next PostWhat Is Plantar Wart and How to Differentiate It from Other Wart Types?